- Power supply and 3 AA batteries included! I echo a previous review. 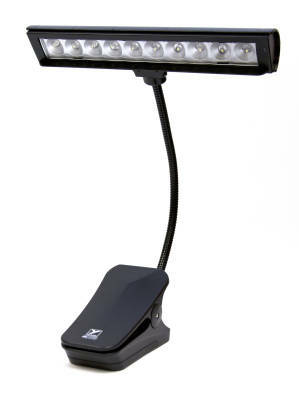 This light works well, but if you are gigging and need to fold it up - forget it. The gooseneck twisted out of the lamp hood, baring the wires. Not long after, the lamps began to fade and some failed completely by the time I totally gave us on it. One more piece of junk. Poor build quality, broke after 3 gigs even though it was well packed and taken care of. It's okay I guess as long as you never take it anywhere. It is now never to be moved from a piano stand and I am purchasing something better made. Don't buy if you plan to take a light for gigs. This is a superb addition to your music stand, especially if you have older eyes.